* The beginning punch is manly sweet. Citrus and lavender, like a traditional man’s cologne sweetened with a strong, boozy rum note. * The rum grows stronger as the citrus quickly fades. * While not projecting strongly, this scent does have presence and makes itself known. * The rum note is joined by a sweet candied tuberose, similar to Vamp A NY. * The base is a snuggly mix of caramel, vanilla, and woods. Summary. This is a gorgeous scent which is sold as a masculine but could easily be worn by women. Something about this scent makes me smile every time I spray it on – it’s sweet but not overly sweet. There is a depth to it that encompasses you. Longevity is excellent at 12 hours, and it’s office safe, as long as you spray it on at least 30 minutes before you go to work. This is a scent that was a love at first sniff, so I pretty much bought it after a quick smell at Sens Unique in Paris. The girls there know me and directed me to it. The girls really know me – at least based on how perfectly this scent works for me. 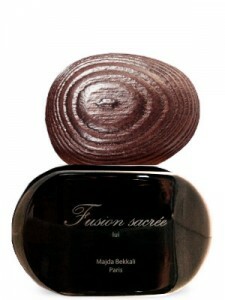 Majda Bekkali fragrances are available through Lucky Scent and Min New York. Disclaimer: Bottle purchased by me – no disclaimer needed. Image courtesy of Lucky Scent.